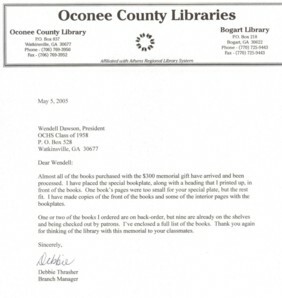 CLASS OF 58: Members contributed eagerly and raised enough money to contribute $00.00 to the Oconee County Libraries in memory of all deceased members. Several books were bought and a label of names of Class members and pictures of deceased members was placed in the inside cover of the books…. 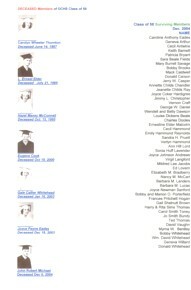 The Oconee County High School Class of 1958 had 57 graduates. The class bonded and kept in contact over the years. The Class has held a reunion every year since graduation in June 1958. The reunions have been at various places: Harris Shoals Park, Bell’s Lake, Downtowner, Holiday Inn, Watkinsville Community Center, Farmington Community Center and the Bogart Community Center. The class has lost seven members to death and the loss of each was felt deeply by the surviving members. The most recent death was John Robert Michael of Bogart who died on December 6, 2004, after a long illness. The Class donated a Book to the Bogart Library in memory of John Robert. Members contributed eagerly and raised enough money to contribute $00.00 to the Oconee County Libraries in memory of all deceased members. Several books were bought and a label of names of Class members and pictures of deceased members was placed in the inside cover of the books. The most recent Class of 58 reunion was held on June 18, 2005, at the Bogart Community Center.